Blank for Dexter Ferry. There is a pencil drawing on the blank of him. The yellowish discoloring is from shellac used to seal the plaster. 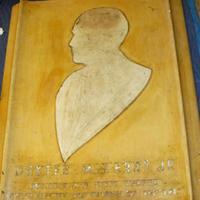 Plaster portrait plaque of Dexter Ferry. 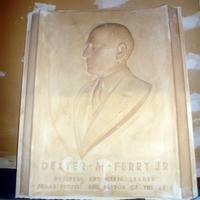 The text on the relief is "Dexter M Ferry Jr Business and Civic Leader Philanthropist and Patron of the Arts". 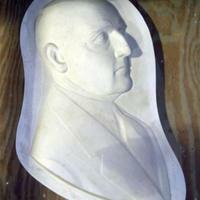 Portrait relief of man, Dexter Ferry, looking to he right in profile. 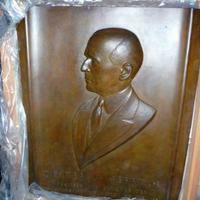 Signed "Marshall Fredericks 19[??]"